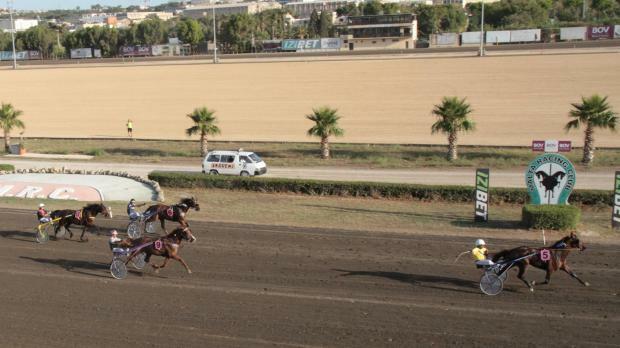 Ten-year-old, Ut De Dompiere, driven by Michael Ellul, won the major race at the Marsa Racetrack, yesterday. This was the Prix De Vincennes final for French class Premier trotters on a short distance of 2140m. This final formed part of the 30th meeting of the season made up of eight races all for trotters and which included five finals for French trotters all on a short distance. Eleven trotters lined up for the class Premier final. Favourite Ut De Dompierre (Michael Ellul) was the fastest horse at first and led all the way to triumph easily by two lengths from Truscott Du Guepre (Rodney Gatt). Emmanuelle Morvillers on behalf of Le Trot and Edwin Borg, MRC Chairman, presented the trophy to Ellul and to Stephen and Alfred Ciangura, the driver and the owners respectively. In the Prix d’Enghien final for class Gold trotters there was a keen duel in the final straight between the early leader Team Monceau (Marco Debono) and Un Amour Du Pont (Andrew Farrugia). It was the former which earned the win. Driven by Noel Baldacchino, Uveo De Maza, dashed strongly from the outside during the last 300m of the Prix De Cabourg final for class Silver trotter to register its second win in Malta. In the Prix De Cagnes Sur Mer final for class Bronze trotters, it was favourite Carat Darby (Rodney Gatt) which claimed its fourth win in a row and in Malta. Cesar Du Buillon (Rodney Gatt) sealed its third win in a row and its fifth of the season.